Can you escape debts by changing countries and states? Ethically, not paying back debts is one type of theft and an act of stealing, actually! You owe someone money and you are not willing to repay! What does that even mean? It means you are a con man!! Believe it or not. But here is the twist! It’s okay, you can be a man so con unless you get caught!! Hence the topic we will be dealing right now is pretty interesting. The creditors are some of the smartest creatures you encounter on Earth. They seem to know every place in this world. No matter how hard you try to escape paying off debts, the creditors and collectors will figure out every way possible to get back the money, if the amount of debt is really huge. Now, that’s the game, “if the amount is huge”! 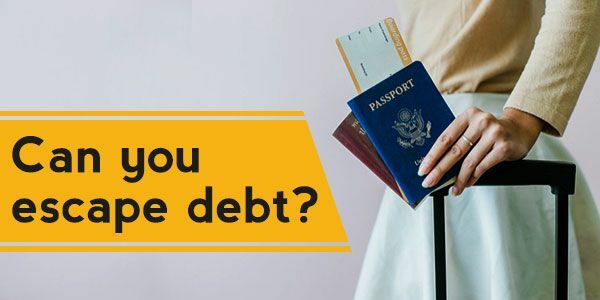 For some $1K or $2K debts, probably they won’t harass you much, as bringing down judgements on you in a different state or country is a pretty costly deal! The court proceeding is so pricey that it will be a loss for them to go behind such small amounts! But, don’t you ever think they can’t trace your whereabouts in some other distant land. They very much can, and the fact that they won’t come for you if the debt amount is small, is also questionable! What steps can you take, if you really want to escape your debts? Whenever anyone asks me how to get rid of debts, or how to escape debts, I say, you just can’t. I instead tell them that what they can do is deal with their debts, face to face! If your debt amounts are really big and you feel there’s no way you can pay it off in full or even half of the amount, then you should try out debt settlement! Settling your debts is what I think the best thing you can do, to maintain your credit, and also for happily saying goodbye to the creditors! Still, settlement can also not be an option if your saved up amounts are not enough to offer a lump sum against your debts! In that case, you might think to escape your debts by running away from them! But, there are many costs associated with your moving to a new state or country, like finding a residence in that foreign land, finding a job, getting a decent neighborhood, and so on! Plus there’s lifestyle cost! I believe, it’s better to pay off your debts in a lump sum amount and get done with it for good, than roaming around state to state. Eventually, there’s another option open to you if you are really helpless! It’s none other than bankruptcy. There’s absolutely no reason to be scared of any social reputation or stigma that’s connected to bankruptcy. What can you do, if you don’t have enough money to pay off your debts? At least you are not running away from a situation like a coward! First, they won’t come for you! They are interested in something big, in something more important! They will come after your assets that you have left behind. Any loose end and they will pull it! Assets might include all non-exempt properties like your house, cash, savings accounts, bonds, mutual funds, jewelry, furniture, livestock, security deposits, other personal properties, and so on! Even they can garnish your wages if you are still under a contract with your previous employer! If you have no assets down here and if they figure out that you no more live in this state, then they will issue a judgement against you in court or will let a collection agency take the pain. In your absence, the creditors or the collectors will win the judgement by default! Now begins the real game of hide and seek You run and hide while their work is to find. If you do an affidavit and change your name, then you probably are the dumbest of all! What you can do is find someone like ED in “Breaking Bad”, who can make you disappear from all public records give you a completely different identity, and a faraway land to live in! But ED helped Mr.Walter White in Breaking Bad, who was a drug kingpin, and money was the last problem for him! Even if they can trace you in the new country or state, they will still not come for you! They will go to the respective state court, bring along the judgement from the previous state, and finally sue you with all due respect as per the laws and regulations of your new residential state or country. Hence, you are trapped! Trust me, creditors and collectors have pretty big reach. Moreover, if you think that you have strong contacts with high authority personals, the federal bureau, tax officers, or the government itself, then you would not have been here reading this article! You would have already run away with the money to anywhere you wanted to! Coz, real men don’t make a fuss, they do hush hush!